Tim White, Associate Professor of History at New Jersey City University, will discuss his book Blue-Collar Broadway: The Craft and Industry of American Theatre. Professor White last spoke at the Library in September 2017, kicking off our World War I series with a lecture about the events that led to US involvement in the war. 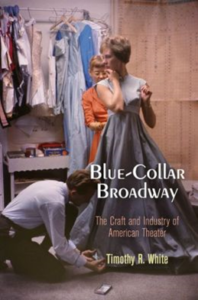 Blue-Collar Broadway presents a behind-the-scenes look at the craftspeople who brought Broadway sets, props, costumes and more to life, and it studies the impact that the Broadway theatre industry had on the history of New York City. Copies of the book will be available for purchase and for Prof. White to sign. Complementing this discussion will be performances of a few romantic Broadway songs.